Comet C/2013 US10 (Catalina) continues to be visible at around magnitude 6 to observers in the southern hemisphere. For people north of the equator, we’ll have to wait until late November when it will become an early morning comet. One date to mark on your calendar is the morning of December 7th. 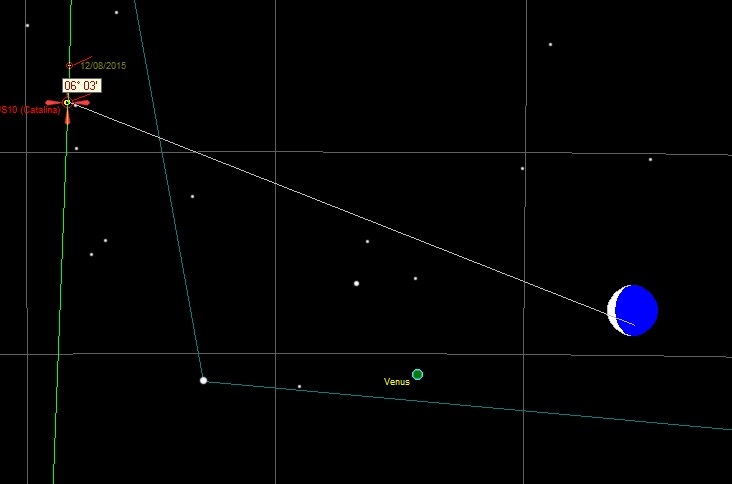 A wonderful early morning opportunity to spot C/2013 US10 next to Venus and a Lunar crescent all within a 6 deg window. This will be fairly low (20 deg) over the South-East horizon. Under dark skies it should be observable to the naked eye. But binoculars or even a camera zoom lens will provide for better observation. This entry was posted in Events and tagged Astronomy, Comet, Moon, Venus by Benoit Guertin. Bookmark the permalink. Very nice post there! Thanks for sharing it, hope to see more great things from you!